Sport Public Relations 2 Edition "Sport Public Relations: Managing Organizational Communication, Second Edition, " takes a comprehensive, businesslike approach to the practice of public relations in sport. Rather than address public relations only as a means of supporting the marketing function or leveraging the medias interest in an event or organization, this text recognizes public relations as a function that is integral to many aspects of a sport organizations goals. The book covers all aspects of public relations, starting with the foundations of PR in sport and progressing all the way through legal and ethical issues that sport public relations professionals encounter. The second edition has been reorganized to better emphasize new opportunities for sport organizations to directly engage the masses and function as their own media. Following are some of the exciting updates to this edition: - Discussion of social media and other e-technologies now permeates the entire book rather than being limited to a single chapter. - Updated chapters on new media, corporate social responsibility, and legal and ethical issues reflect areas of growing emphasis and concern for sport organizations. - New "Insight From a Professional" and other sidebars offer readers a firsthand account of the roles of PR professionals in todays sport environment. - A complete set of ancillaries helps instructors incorporate e-technology into their courses and prepare engaging class discussions. 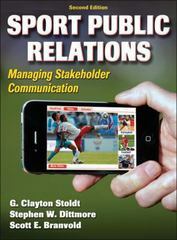 In a clear and engaging style, "Sport Public Relations, Second Edition," expresses the roles of public relations and PR professionals as vital components to a sport organizations overall management. Updated tools including sample media releases, credentials letters, and media guides provide students with tangible examples of the work that PR professionals produce. Special elements throughout the text teach students what sport communication work is like, the tasks and dilemmas practitioners face, and available opportunities and careers in the industry. Real-life examples and historical events demonstrate how sport communication has evolved and the vital role it plays in effective sport management. Chapter objectives, key terms, summaries, and learning activities keep students focused on key topics and allow them to better prepare for course projects and class discussion. "Sport Public Relations, Second Edition," provides the theoretical basis for industry practice as well as guidance on applying those concepts. Readers will learn about the history of sport public relations and how it is evolving; the foundations for effective media relations in sport, including information services and organization media; and the critical need for a crisis communication plan and management considerations. Readers will also consider the diverse forms of public relations practice, encompassing media, community, employee, investor, customer, donor, and government relations. With this text, both students and professionals will understand the full range of functions in the realm of sport public relations and how to be progressive in their current and future public relations practices.